NetSuite is billed as the #1 Cloud ERP Software. Shopify Plus is the world’s most scalable and robust Ecommerce Platform. The common thread between both applications? The businesses that use both. But, there’s a catch. Businesses using NetSuite and Shopify Plus aren’t your regular run-of-the-mill businesses. They’re complex, they’re unique, and they’re sophisticated. So why do these scaling SMB to Enterprise-level businesses often insist on using unsophisticated data integration strategies and solutions? The thing is, complex applications like NetSuite and Shopify Plus punch at a heavier weight class than solutions geared for smaller businesses with a single revenue stream and plateaued growth. Businesses who implement these applications do so with specific needs in mind to meet strategic goals and keep growth on track, and as a result, these core applications are often tweaked and customized to fit these needs exactly. When you’re on a trajectory, you need things to work exactly as your business requires to keep everything moving together like a well-oiled machine. On top of this complexity within the applications themselves, businesses using the power combination of NetSuite-Shopify Plus have complexity throughout their broader back-end technology stack — and beyond. Multiple sales channels online and in the physical world, a growing supply chain, and business-specific rules tied to how every element intersects compound the intricacies in how to tie everything together. All this unique sophistication begs for an equally sophisticated integration solution. Tying the incredible powers of NetSuite’s ERP system to Shopify Plus’ ecommerce platform (and vice-versa) is a challenge that should not be embarked upon lightly. And although the tides are shifting — more and more upper-SMB and burgeoning Enterprise omnichannel businesses now know that data integration is a strategic objective that can make (or break) their targets — there are still many businesses out there who still end up on the wrong path to their ultimate solution. Put simply, DIY hard-coded integration solutions and plug-and-play integrations are not sophisticated enough for the user base attracted to the combination of NetSuite ERP and Shopify Plus. This community of businesses demand agility, scalability, and transmutability from their integrations. They expect that data is moved perfectly from one application to the other and back again, seamlessly and in real-time. They need perfect data, transformed to fit their specific business rules at every pass, so that their data is where it needs to be, when it needs to be, and in the perfect form it needs to be in so no time is wasted. They demand a different level of sophistication from their integration solutions. And there are few better out there to address these exact needs beyond VL OMNI. Unlike static plug-and-play integrations or DIY and PHP coded integrations, iPaaS integrator VL OMNI builds our Connectors to meet the needs of our business. That means we put our customers’ requirements of their integrations at the forefront of everything we do, instead of forcing your business to conform to fixed requirements as is the case with low-quality solutions. Your data, your movements, your timing, your everything; we configure the connector to fit. But it goes even deeper than that. Need to change a data field or function? Add, change, or remove a trading partner? Changing the application mix in your technology stack? VL OMNI Connectors are plastic to your business’ needs, and can change without costly reprogramming or downtime. Watch this video where we talk about how one of our customers saw an immediate improvement in their business in changing their integration strategy from DIY coding to VL OMNI. Best yet? : VL OMNI is the only GDPR compliant integration platform for Shopify Plus merchants. 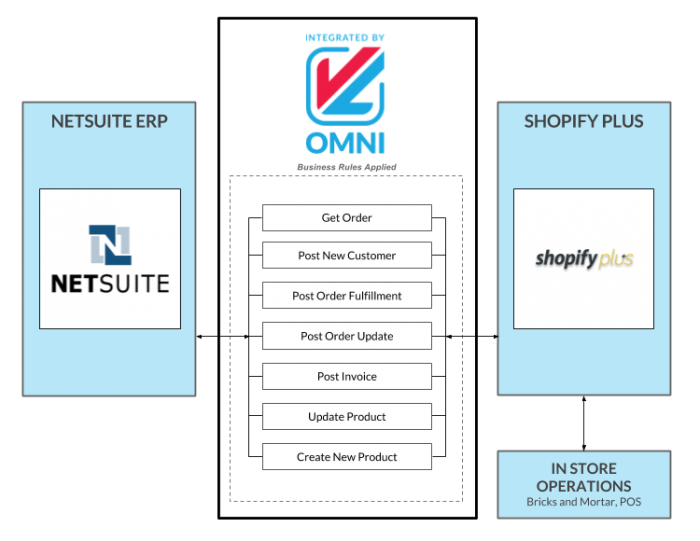 But the need for complex, agile, and scalable data integration doesn’t end at NetSuite and Shopify Plus for VL OMNI. Our Connectors are designed to be modular: any one Connector can be integrated with any other Connector from our library with minimal configuration and no custom coding. With over 300 Connectors in our library and more being added constantly, VL OMNI is quickly becoming the one-stop-shop for complex integration projects in the omnichannel retail community and beyond. So if you don’t see your applications in our Connector Library, reach out to us — there’s always a ton going on behind the scenes at VL, and we’re happy to let you in on the inside scoop.